On February 4th, 1999, one of the greatest hoaxes in video game history began. 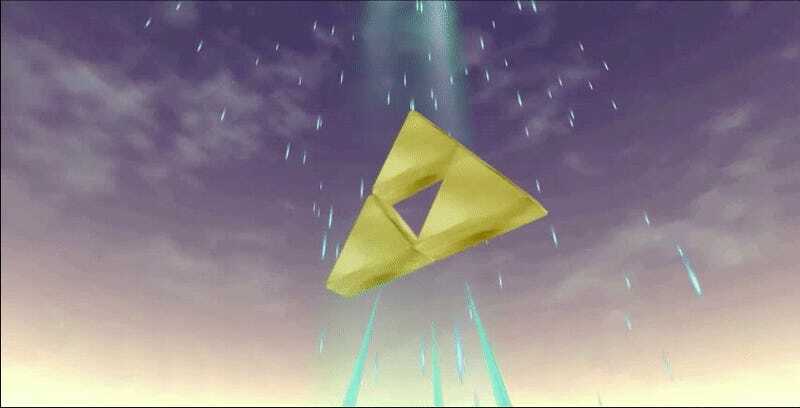 The Zelda fandom was shock by a player claiming to have found the Triforce in Ocarina of Time. Ariana Almandoz, a gamer from Colombia, had all the details, but she wasn’t quite ready to share them with the world. Through vague hints and convincing screenshots, she lead the fandom on a wild chase for Zelda’s legendary treasure. This piece originally appeared 12/8/16. Hyrule: The Legend of Zelda (also called HTLOZ) was the website to talk all things Zelda in the late 90s. It was where you went if you wanted all the new information and rumors. Here, Almandoz first told Zelda fans that she had somehow found the Triforce. For those not in the know, the Triforce is a big deal in The Legend of Zelda. It is a legendary artifact of the gods that can grant wishes to anyone who obtains it. The bad guys want it. The good guys want to protect it. In Ocarina of Time, you never find it as an in-game collectible. The email Almandoz sent didn’t contain any images of her feat, however. When pressed by HTLOZ staff to provide proof she’d found the Triforce, Almandoz claimed that she forgot to send the screenshot. A day later, she sent it. Ariana Almandoz sent this image as proof that she discovered the Triforce. The watermark is from HTLOZ. The image ignited a wildfire of speculation. Some thought that it was a picture from the game’s beta but many others were convinced it was the real deal. No one had seen anything like this before. The ultimate Zelda prize seem within reach, and readers wanted to know what they had to do to find it too. Almandoz wasn’t ready to share that process in full, however. Instead, she only gave hints. The process involved the Temple of Time. You also had to get a new song to play on your ocarina. Fans were not pleased. If she knew how to get the Triforce, why wasn’t she sharing how she did it? Almandoz eventually got more specific with her information as the rumor gathered more and more attention. She started to paint a picture of how to acquire the legendary artifact. To get the Triforce, you had to learn the Overture of Sages. It was an entirely new song for your ocarina taught by the owl Kaepora Gaebora. But Almandoz refused to explain the steps required to obtain it. Almandoz sent another picture that led to her being caught. To back up her claim, she provided a new screenshot of Link playing the song, along with another photo showing him entering the “Temple of Light.” A new song? A new temple? It appeared that there were entire sections of Ocarina of Time that were hidden from everyone but the luckiest of players. But then fans something was amiss: Link was wearing his sword on the other side of his back. When pressed, Almandoz played coy and hinted that there was a special reason for everything. Wait a little longer and she’d totally reveal it. A forum user named Ryan Costello pored over the screenshots and pointed out other small problems. He matched the screenshot of Link with his ocarina to the original image. The whole affair, featuring Almandoz’s emails, has been archived in full. You can judge for yourself if Almandoz was a daring mastermind trying to point out weaknesses in the fandom or a bumbling troll making it up as she went along. In 2005, a forum poster named IceSage confessed to being Almondoz. Is that true? Probably not; the message dropped on April Fool’s Day. It is, however, the closest we’ve ever come to figuring out who pulled off one of gaming’s greatest hoaxes. Well played, ‘Ariana.’ You might not have found the Triforce, but you did carve a strange place in gaming history.